Through the course of romantic interactions between the intelligent community — a politically correct way of designating “nerds” — there has usually been paradoxically low expectation for amorous gestures and expressions. There is an underlying belief that there is an inverse correlation between book-smarts and street-smarts, meaning that all those guys with a 4.0 GPA have a large propagation of uncertainty in their ability to “get the girl.” Don’t freak out if you’re intimidated by all this technical jargon — we’re prepping you to read the work of a man who we now refer to as the king of the nerds … or simply Brendan if you’re on a first-name basis. It might seem to be something straight out of “The Big Bang Theory,” but it’s probably a better overall story than the recent surge in hookups. Though the paper would probably earn a deserved F by any “sensible” grader – any student at Cal would love to tell you an instructor’s affinity for pointless details and an irrelevant page count — it likely gets an inordinate amount of brownie points for cuteness. But the latter doesn’t manifest itself in terms of grade, so we’re break this paper down with all the wrath and intensity of a general chemistry GSI — without spoiling the ending, of course. to nothing about how two-body interactions — a thinly veiled reference to the general dynamic of relationships. He teases the ending better than Allen Crabbe’s teasing us into thinking that he’s a viable candidate for National Player of the Year, and shows off his ability to use a dictionary by substituting the word “hydrometeor” for the societally accepted normal term of “rain.” An intriguing premise no doubt — meeting in the rain, and the promise of compatibility at first sight a la “The Hunger Games.” The addition of three to five more bodies can be deemed a bit questionable since adequate context isn’t provided; if that rate continued, even Wheeler Auditorium couldn’t fit all those bodies. He then spirals off into a tangent about different types of interactions with these aforementioned extraneous bodies, which could be interpreted as an admission of cheating with other “local, interstate, and international” girls. He then makes a switch to his native field of Physics where he sounds like he knows what he’s talking about. He introduces the high school concepts of forces, more specifically stress and tension — allusions to actual emotions that serve as vector forces driving them with equal magnitude in opposite directions. It is unclear how the homemade food served to make these “interactions” work, although the martial arts classes likely let some of that stress be diverted elsewhere. The portrayal of happiness with respect to time is laughable – it appears at first glance to be a very flat parabola, like the beginners in Math 16A are prone to drawing. 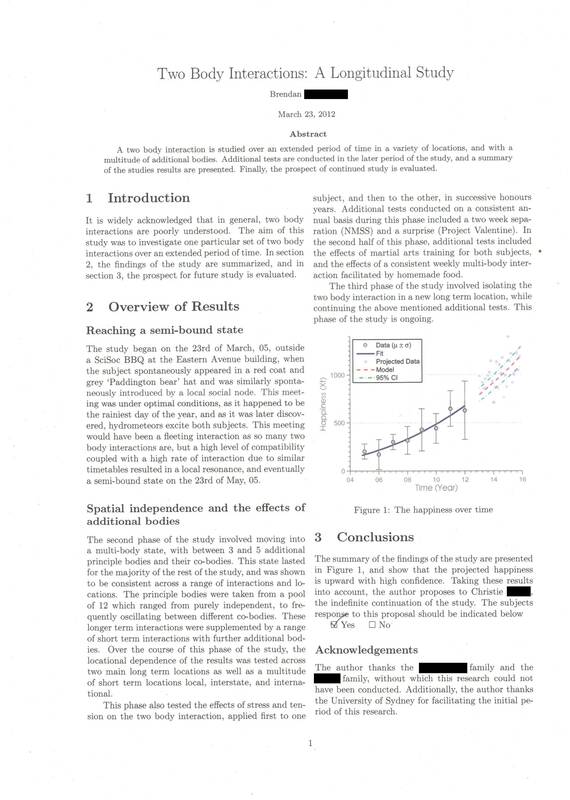 At further inspection, the standard deviation appears to be especially high for years two and eight, indicating that he could have fudged the data to make it fit the estimation better. And he has the nerve to call that high confidence? Despite our attempts to undermine the work he has done, we at the Clog give kudos to the mystery man for having the will and the brains to pull something like this off. 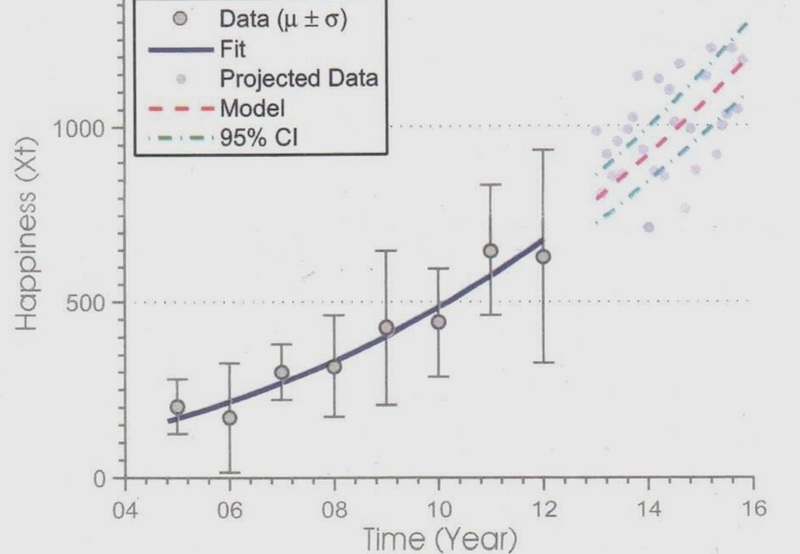 If that model continues according to your projected data, you’re a very lucky couple. Have fun testing your coefficient of kinetic friction together!